Friendly, attentive service and a casual atmosphere make JT's a favorite for locals and for those just passing through. No pretense, just good Florida Fish Camp style eatin'. This means large helpings of our freshly caught Shrimp and Crab which come in our World Famous (and traditional-styled) Crab Pots and Shrimp Pots. Pair that with one of our 12 ounce Rib Eye, Crab Cakes, Baby Back Ribs or Southwestern Chicken and you’ve got yourself a real meal. "Did you misplace your next meal? Because we just found it." "Let your taste buds do the talking. http://bit.ly/2Dq328z"
"Thanks for taking the drive with us. Here's to many more miles and smiles to go!" "Beauty is in the eye of the fork holder. Which of our dishes do you think is presented in the most creative and intriguing way?" "Made fresh for you every day." Yes, I'd like to receive news from JT's Seafood Shack. 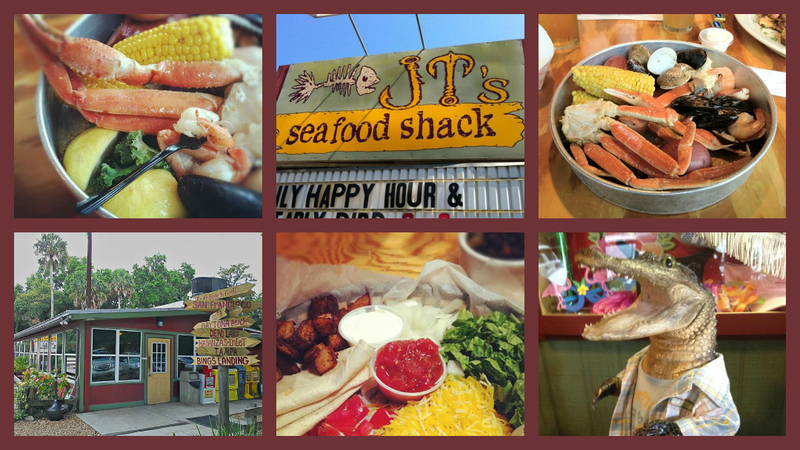 Sign up for the JT's Seafood Shack Newsletter!